The next time you request a ride through Uber, you might wind up waiting longer than expected. As the Milwaukee-based TMJ4 discovered on the streets of Milwaukee, some Uber drivers are not where they appear to be. One frustrated driver for the ride-sharing app is convinced some of his competitors are cheating the system. "If you don't know where to sit, you ain't making money," said Uber driver J'Gai Starks. Starks said that competition over the prime spots to pick up rides has enticed dishonest Uber drivers to fake their locations on the app. This allows an Uber driver to appear in the app some place it is not, such as in a no-parking zone outside a hotel. Starks said he noticed this happening in late 2016 and complained to Uber about those phantom vehicles. "These guys had their icons in places I couldn't be. So I had to ask [Uber] what's up with this," he said. J'Gai Starks invited the I-TEAM along for a ride to see Uber drivers appearing to alter their locations within the Uber app. According to online forums and chat rooms frequented by Uber drivers, a smartphone can run software that fakes or "spoofs" a driver's location in the ride sharing app. Spoofing can make a driver appear to be in a prime parking spot in a busy part of town while they could be parked at home, miles away. That allows dishonest drivers to cheat the Uber system that pairs potential riders with the closest available cars. An Uber spokesperson confirmed spoofing is an issue, though she said it is not widespread. Still, a handful of drivers faking their locations can take valuable rides away from those who play by the rules. Over a two-day period, TMJ4 found three Uber drivers who were nowhere near where the app said they should be. Outside the Johnson Controls offices on Jefferson Street, we encountered the driver of a phantom Mercedes. For 20 minutes, we watched as the Uber app showed her car in a no parking zone outside the building's front door. That entire time, there was no vehicle where the app said one would be. When we were connected with her car for a ride, it took about five minutes for her to drive to the location. Asked why it took so long for her to arrive, she responded "I was around the corner." While the Uber app showed a black car parked on the median of Layton Avenue, just north of the airport, there was no car fitting that description anywhere near that location. When the app paired us with that car for a ride, the vehicle icon suddenly jumped from Layton to a location on Whitnall Avenue. Another phantom Uber was repeatedly appearing in the median of Layton Avenue, just north of Mitchell International Airport. When we matched with that Lincoln Town Car for a ride, it vanished from the median and re-appeared several blocks north of Layton Avenue. That driver blamed the app. "Sometimes it's stuck," he said. When challenged as to why the app would have "stuck" him in that location for three days straight, he replied "I don't know." An UberBlack appeared to be parked in a no parking zone just west of the intersection of Chicago Street and Broadway in Milwaukee's Third Ward. However, when the Uber app paired us with that vehicle for a ride, the icon jumped five blocks east and started driving toward our locaiton. A third phantom Uber appeared to be in a no parking zone near the corner of Chicago Street and Broadway in the Third Ward. When summoned for a ride, the Cadillac SUV vanished from its location on the screen and re-appeared five blocks to the east. The driver said what we just watched happen did not occur. He blamed the app for putting him in a prime spot blocks away from his true location. 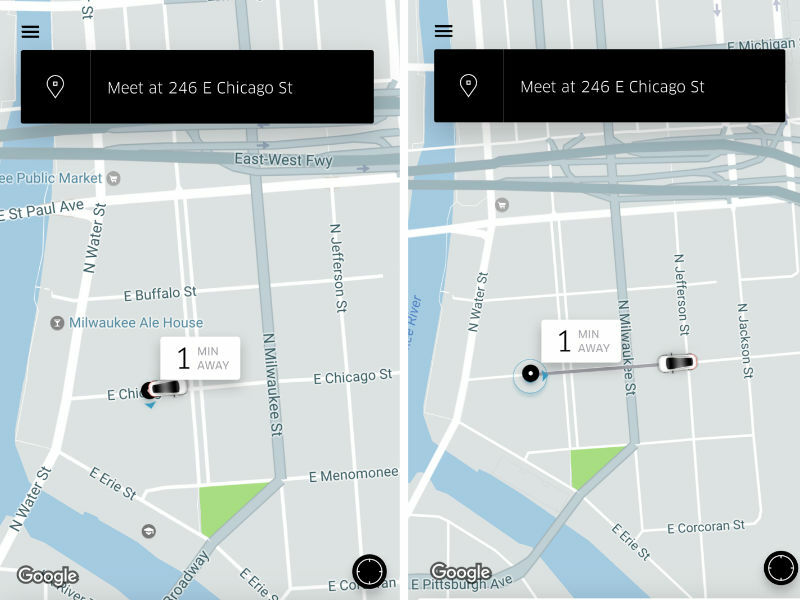 Presented with information on all three of these phantom drivers, Uber took a closer look. "We take allegations of fraud very seriously and are conducting a thorough investigation into this matter," a spokesperson said. While the company would not confirm specific details about the drivers we encountered, Uber said several Milwaukee drivers have been "deactivated" recently for violating terms of service related to the Uber app. The spokesperson said spoofing a GPS location would violate Uber guidelines and could result in a driver being banned from Uber. "We’re constantly working on ways and tools to combat fraud and have many safeguards in place to prevent it," she said. To J'Gai Starks, who first complained about suspected spoofing in December, that response was overdue. "It seems like they're not worried," he said. "I don't know if they're not worried or the process to do something is just too slow." Uber encourages all passengers to report suspicious activity by drivers, including possible location spoofing. To file a report, visit the Uber website .